They’ve finally figured out how to create a rush on Provence rosé, and by “they” I mean Brad Pitt and Angelina Jolie, and the secret was to put their names on the label. The 2012 Chateau Miraval “Pink Floyd” Rosé has spurred a lot of discussion about celebrity winemakers but the truth of the matter is that it’s a non-issue. The notion of living in a Chateau in Provence is a pretty pleasant one, and if I was a millionaire a couple of hundred times over it wouldn’t take much arm-twisting to sell me on it. Who would be so churlish as to label someone a dilettante just because they can afford to buy a vineyard that they haven’t slaved over since they knew how to walk? There are comparatively few wineries in Southern Ontario that are family affairs handed down through the generations. Plenty of the rest are owned by financiers, professional athletes and internationally recognized actors. My guess is that most of these proprietors are sincerely interested in wine, and this guess is predicated on the notion that if you already have lots of money, there are easier ways to make more of it than by investing in a winery. A wine will succeed or fail on its own merits, once consumers get past the initial novelty of recognizing the name on the label; you’re not going to get rich selling bad wine no matter how beloved you are of the people. If I saw a bottle of Chateau Miraval on the shelf I’d probably pick one up just for the sake of having an opinion about it. Considering, however, the that the wine is in fact made for the Jolie-Pitts by the venerable Famille Perrin (if you drink French wine, you have almost certainly consumed some of theirs) it’s likely that the wine’s position in the market has been well thought out, and that it will perform on your table in the manner of a $25 rosé. I usually ask less of my rosés – about five dollars less. Coincident to this discussion of celebrities and wine, The Dreaming Tree Crush Red Blend (2012) is currently available from the LCBO, general list, for $14.95 (on sale from the regular $16.95 until April 1). Those familiar with the tune may conclude immediately (and correctly) that this wine is produced in part by musician and sometime actor Dave Matthews. Matthews has been involved in the business for a few years now, with The Dreaming Tree being his second winery after Blenheim Vineyards in Virginia. His attitude of “Let’s not do this to make money, let’s just make the best wine we can,” as stated in Food & Wine in 2005, supports my thesis about celebrity winemakers, assuming it isn’t just marketing boilerplate. And let’s face it, it’s Dave Matthews, and you kind of want to believe him. 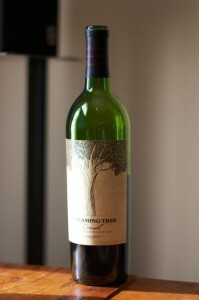 I had to do a bit of digging on The Dreaming Tree website to find out what was in Crush, and along the way I heard a lot about his objective of making uncomplicated wines that “anyone can drink.” It turns out that Crush is a Merlot/Zinfandel/Syrah blend, and if you think that’s going to make a pretty fruity, ripe-tasting California table red you’re not far wrong. Strawberries, blueberries and plums are all in evidence, tannins are present but restrained, and acidity is moderate to low. Mission accomplished. A stated alcohol of 13.5% could be a relief to folks who like a big ripe glass of fruit but are scared off by the high alcohol levels that usually accompany wines of that style. Many of us prefer our wines to be at least a little complicated, of course, and when I passed a bottle around a group of casual (old world) wine drinkers recently the consensus was “not really my thing.” It did, however, make for a lively conversation piece. As for food pairing, I’d suggest similarly uncomplicated food; this wine would be at home next to some barbecued fare or even just some soft cheeses on the deck at the cottage, preferably in the company of some Dave Matthews fans. For that picnic table scenario alone I give it 86 marching ants.